Three of our favourite Scottish cheeses combined with handmade chilli jam made along the road and traditional handmade oatcakes made in nearby Fife. This delicious selection is enjoyed by many of our guests as a lunch or dinner in its own right, or eaten as nibbles with wine over the course of their break. Red Anster Cheese is made by Jane Stewart, a dairy farmer in nearby Fife. The cheese is similar to a crumbly Cheshire cheese with fresh herbs, chives and garlic producing a full flavour. Featuring all the characteristics of Brie, Morangie Brie is a smooth, sweet, creamy cheese made from pasteurized cow's milk. The cheese is produced by the Stone family at Blairlaith Farm in Tain, Scotland, where their business, Highland Fine Cheeses is based. 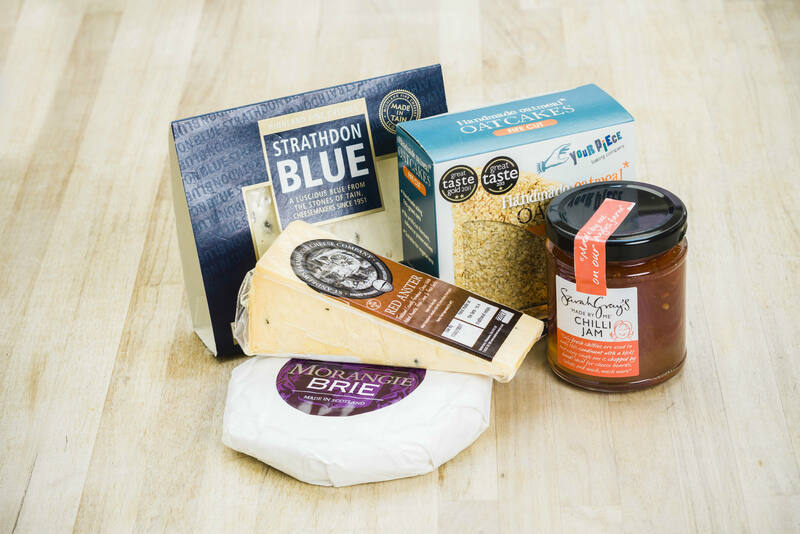 Strathdon Blue is a rich, creamy blue cheese also made on the same farm in the Highlands.